It’s kinda crazy to think about how much I’ve learned in the last three years of blogging. There’s all the stuff about baking and cooking, but also other things like and HTML/CSS skills from messing around with blog templates and taking photos manually with a big-girl DSLR camera. Then there's also the weird little facts and trivia I pick up, mostly from conversations with folks who read my blog for fun. I mean, to wit — just last week, my coworker was telling me that she enjoyed reading my post about yellow cupcakes and was especially excited to find that I'd mentioned graham flour as one of my favorite ingredients. She and I attended the same college for undergrad, and had gone through the same process of writing a year-long thesis during our senior year which culminated in an orals defense in front of a board of professors. It was tradition for thesising seniors to bring food and drink to snack on during these orals as a kind of “bribe” to the professors. Sometimes, the food would be related to the thesis topic. In her case, she’d brought biscuits made from graham flour. “Oh, like graham crackers?” I said. “Kind of, but minus the butter. And the sugar.” She then went on to explain that graham flour was invented in the 1800s by a reverend named Sylvester Graham, who disapproved of the discarding of nutrients and artificial bleaching of making white flour and believed that using whole grain flours (like his namesake graham flour) was a remedy for the poor health brought on by the changes in diet during the Industrial Revolution. In addition to the whole grains, Graham also preached eating a vegetarian diet full of fresh fruits, vegetables and other high fiber foods, with dairy permitted in moderation. In any case, Sylvester Graham would probably be very disappointed to find that, not only did his masturbation prevention plan fail, but these days, graham flour is only ever used in baked goods like graham crackers that are full of butter, sugar and other ingredients that he loathed. 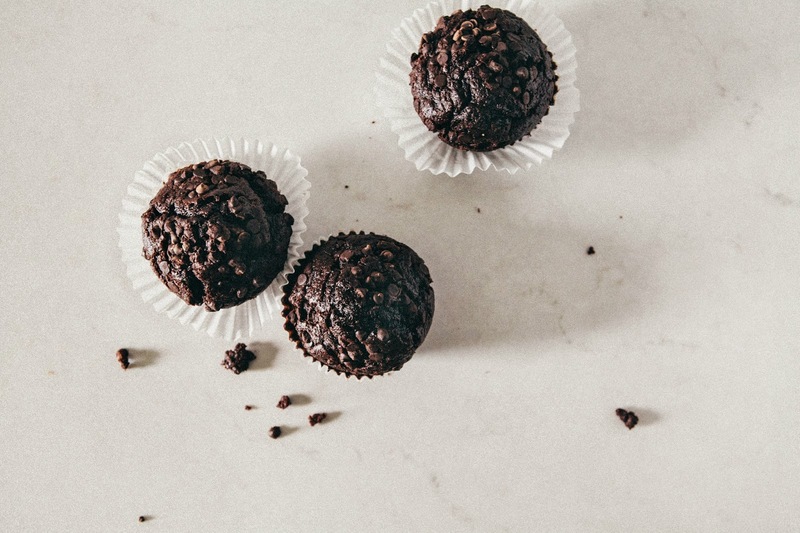 I myself am guilty of swapping out all-purpose flour with graham flour in my favorite chocolate chip cookies and brownie recipes in an attempt to give them more fiber and protein. I also find that using graham flour gives chocolate baked goods a wonderful, unique flavor that’s very slightly reminiscent of toasted nuts and campfire s’mores. 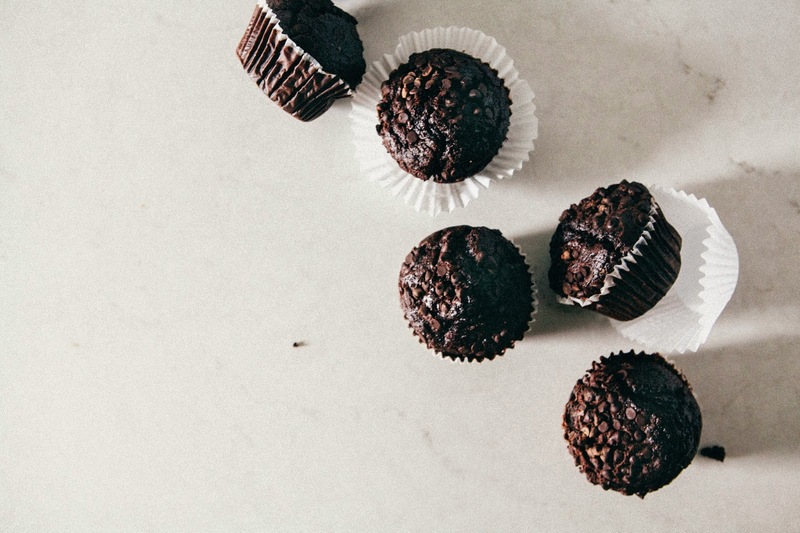 I’ve always been fond of chocolate muffins, but could never really justify eating them for breakfast — until now. 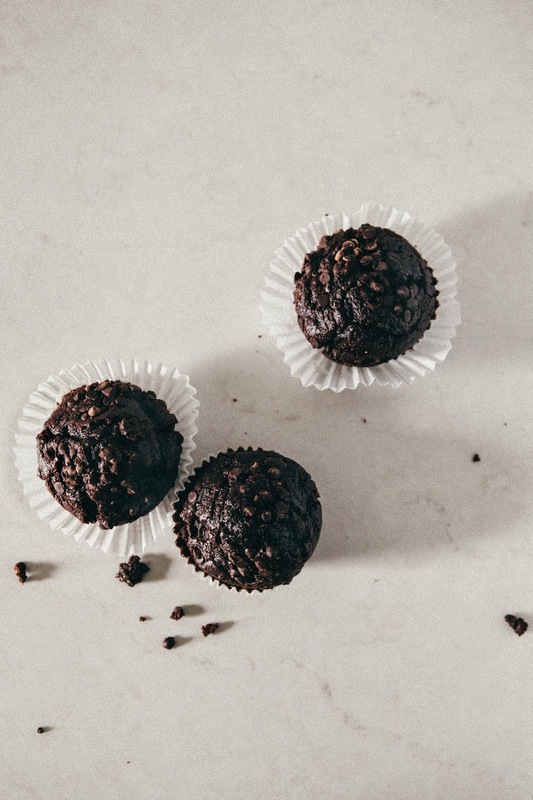 Izy’s recipe uses a generous amount of whole wheat and oat flours that will start your day off with plenty of protein, fiber and healthy fat from coconut oil to keep you going until lunch… all without sacrificing the decadence of a chocolate muffin. Because despite all that health, this chocolate muffin still tastes like a chocolate cake, especially since each muffin top is studded with plenty of chocolate chips. Non-serious bakers don’t understand what a feat that is, throwing in whole grains and healthy fats without compromising any flavor whatsoever. 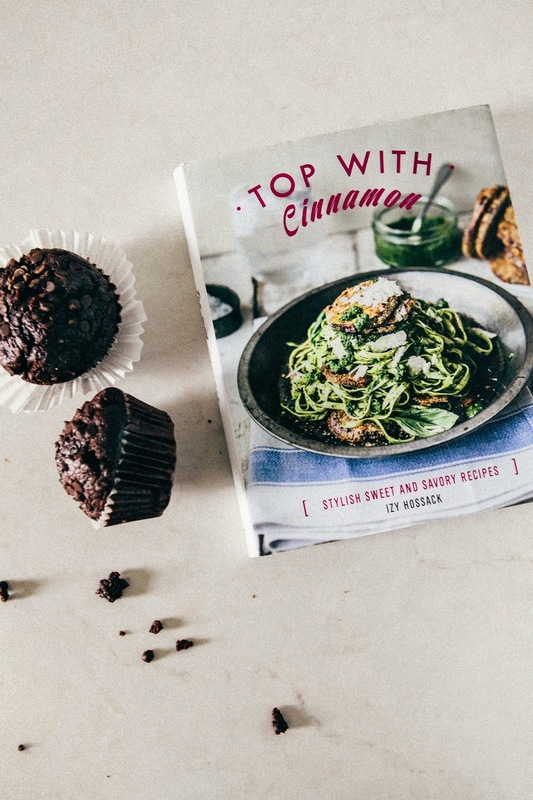 But Izy’s always been a master of recipes that manage to balance healthful eating with, well, decadence (I mean, hello, anybody remember these coconut flour brownies or this chocolate chia ice cream?). 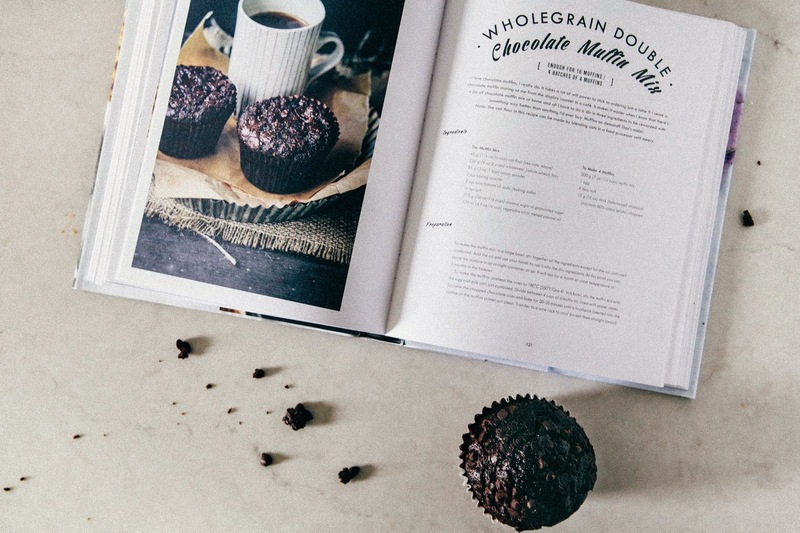 Her cookbook is full of such recipes, and these muffins are just one example of her incredible cooking prowess. Izy's recipe from her cookbook actually makes a muffin mix, which you can store at room temperature for up to 1 month (or 3 months in the freezer). In her cookbook, she breaks down the recipe so you can bake 4 jumbo muffins at a time. I'm including the recipe as it is from her cookbook, but when I made these I doubled the batch quantity and ended up with 12 cupcake sized muffins since I used a cupcake pan. However, if you use a jumbo-sized muffin pan, you'll likely end up with 8 jumbo muffins. The recipe also uses oat flour, which Izy says you can make at home by blending oats in a food processor until mealy. However, I purchased my oat flour from Bob's Red Mill, though plenty other varieties are available online. In a large bow, whisk together 2 cups graham flour, 1 1/4 cups granulated sugar, 1/2 cup oat flour, 1 cup natural unsweetened cocoa powder, 2 teaspoons baking powder, 2 teaspoons baking soda, and 1/2 teaspoon kosher salt until well combined. Add 1/2 cup coconut oil and use your hands to rub it into the dry ingredients until fully incorporated. At this point, you can store the mixture at an airtight container or jar. It will last for a month at room temperature or 3 months in the freezer. Preheat the oven to 350 (F) and prepare your cupcake pan/muffin tin by lining with cupcake/muffin liners. In a medium bowl, whisk together 1 1/4 cups muffin mix with 1 large egg and 1/4 cup milk until just combined. Divide the batter between the muffin liners until each cavity is up to two-thirds full of batter. Sprinkle 1/2 ounce mini chocolate chips over the top of each. Transfer to the preheated oven and bake for 20 to 25 minutes, or until a toothpick inserted into the center of the muffins comes out clean. Note that if you're using a smaller cupcake pan, the muffins will bake up faster and should be ready in around 16 to 18 minutes. Transfer to a wire rack and allow to cool slightly, before serving while still warm. Dude. Costco muffins are the best. The day I figure out their recipe will be a very, very, VERY happy one. OMG GRAHAM FLOUR. This is so, so SO genius, Michelle!!! (Baha and the stories you told -- so good.) I think I still have one or two babies from Izy's recipe hanging out in the freezer, but I already want to try it again with this genius tweak! It sounds phenomenal, and your muffins look appropriately incredible. Oh man. Love this so much, lady! Girllll I dunno — your rendition with SALTED CARAMEL SAUCE looked pretty friggin' amazing to me too! I was reading the post, thinking "huh, yes, what a nice little history lesson," and then BAM, masturbation. Thanks for keeping me on my toes and keeping me laughing. Hahah, that's what I'm here for ;-) Enjoy Portland's "snowpocalypse" today! PS these muffins look insane, graham flour is a brilliant addition. HAH. that is the most random/hilarious tidbit of information that i've read all week. silly sylvester. i do love graham flour though! actually this hilarity actually kind of makes me love it more :) and these muffins!! 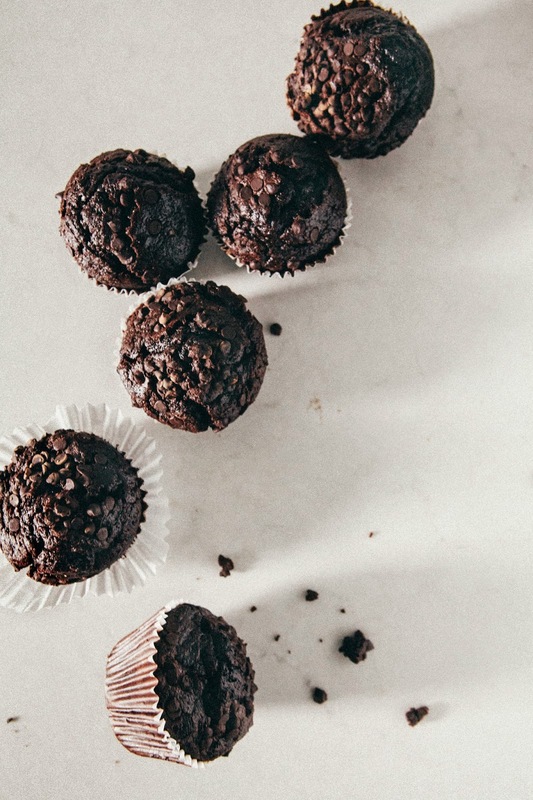 i have had the most random urges for chocolate muffins, i must make these soon. Izy's book is fantastic! I couldn't stop reading it till the last page)) I have made Chocolate Chip cookies from her book (my last blog post)....and they are amazing!! That is one of the funniest bits of history, I've learned this week! Graham flour is one of my favorites to work with. 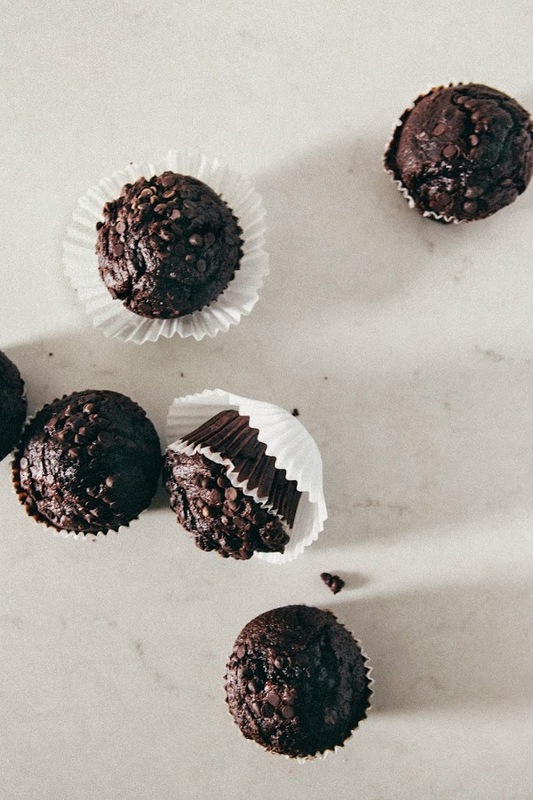 These muffins now, they look nice and shiny with all that chocolate, I've been craving a good breakfast muffin of late and I think these hit the spot.